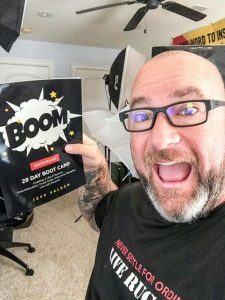 In episode 35 of The BOOM Podcast, youth motivational speaker and author Jeff Yalden wrapped up Week Three of the daily action steps from his brand-new workbook and planner, The BOOM 28 Day Boot Camp: Creating a Life of Success. Find Motivation. Crush Goals. Overcome Obstacles. Live with Purpose. The BOOM 28-Day Boot Camp is the perfect companion to Yalden’s Amazon bestselling book, BOOM! One Word to Inspire Action, Deliver Rewards, and Positively Affect Your Life Every Day. The BOOM principles will change your life, but only if you put them to work for you and stay consistent. You need to improve every day from the inside out. You must embrace growing and should be able to evaluate yourself daily. Let’s start being really honest. Yalden said that when you look at who you are, then how you look takes care of itself. He said to stop worrying so much about what you’re wearing, how you look – if your clothes match or if your hair is OK.
“Start looking at who you are as a person. Embrace the growth – the integrity – the character – the kindness – the authenticity. Embrace the person that you are deep inside. When you work on this, everything else will take care of itself. Admitting and accepting that you have flaws in part of the process, according to Yalden. When looking in the mirror, Yalden said to come to an agreement about what you want to improve. If you work on one thing a month, that’s life-changing – that’s the BOOM! Improve from the inside out – every day.